As some readers already know, the Micrognome has been out of action, suffering the kinetic effects of a vehicle accident. For the second time in a year, our gnome experienced the skills of colleagues in a nearby emergency department. This time, though, he went to work in an ambulance, kinetic effects having already transformed the gnomobile into an untidy sculpture. Entering the ED via a trauma bay is not a highly recommended way to start work. Being on the receiving end of EMST standard procedure was quite surreal, knowing what was going to come next at every step of the way including when and how the nurse will slice through your nice cotton shirt (this hospital will have the shirt off your back!). Happily, the kinetic effects were significantly reduced by the swift deployment of every airbag imaginable. The oncoming vehicle hit the gnomobile’s forward nearside, spinning it round. So the Micrognome was rocked but not rolled. His ribs brushed the edge of the steering wheel. It could have been much, much worse. And it gave the gnome a good excuse to visit his hospital as a mystery shopper, as one helpful friend pointed out. The specifics of this particular MVA aside, the down time has given our gnome an opportunity for reflection on the connection between infection and vehicle collisions, lateral or otherwise. The literature inevitably concentrates on the immediate catastrophic kinetic effects and their consequences. Until recently there has been a paucity of good data on infection as a consequence of vehicle accidents. These non-kinetic effects are now starting to feature in larger population studies. Fraser DR et al. Infective complications after vehicle trauma in the United States. Surg Infect 2011; 12: 291-6. Nearly 800,000 vehicle trauma patients were surveyed in the US National Inpatient Sample (drivers 59%, passenger 18%, motorcyclists 13%, pedestrians 9%). 5.7% (44331 patients) had a post-traumatic infective complication. Those with spinal cord injury had the highest rate of infection complications, and the risk increased with prolonged hospital stay, particularly including intensive care admission for more than 7 days. Kourbeti IS et al. Infections in traumatic brain injury patients. Clin Microbiol Infect 2011. In this study from a neurosurgical centre, 760 patients between 1999 and 2005 with a median age of 41yr were surveyed. 214 developed infection. Multivariate analysis indicated that 2 or more surgical procedures, additional infections, lumbar or ventricular drains and CSF leaks were all associated with increased infection risk. It has been suggested use of probiotics could reduce the infective complications of traumatic brain injury. So why don’t we worry more about infection as a late complication of vehicle trauma? Perhaps the answer can be found in the thinking around the early management of vehicle trauma. One influential consensus conference working on definitions of systemic inflammatory response syndrome in the critically injured patient found that while there was an increased risk of sepsis, severe sepsis and septic shock following penetrating trauma, the only significant difference in mortality was between shock and other categories of physiological deterioration and organ dysfunction (Muckart DJ et al. Crit Care Med 1997; 25: 1765-6). Prevention of infection is therefore best effected by primary and secondary prevention i.e. stop the accidents from occurring in the first place, and minimise their effects through safety features in the vehicles. In view of WA’s recent history of road accident deaths, it was good to hear a sober reminder of the need for caution on the roads over the summer holiday period. Having survived a high impact collision and experienced the cocooning effect of front and side airbags, the Micrognome agrees that younger drivers must be encouraged to focus on safety and not high performance. Worryingly, the data suggest that these is a small percentage of young adults who persistently take silly risks with their lives. A large study in Florida (Eaton DK et al. MMWR Surv Summ 2010; 59:1-142) showed that almost 1 in 10 high school students rarely or never wear a seat belt and over a quarter are willing to ride in a vehicle driven by someone under the influence of alcohol. It’s tempting to think “only in America”, but the recent antics of some high school students closer to home suggest that an ill-founded belief of immortality is alive and well in Australia. 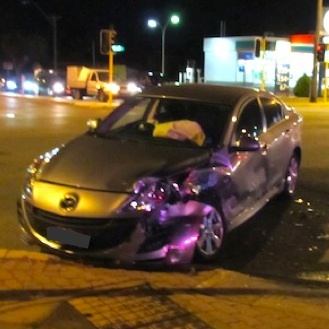 For insight into risk-taking behaviour and how it affects vehicle trauma casualties, an interesting study of the ecology of fatal traffic accidents provides some useful insight (Moller AP et al. 2011). This group looked at the species of birds killed by collision with motor vehicles in one location in Europe. They found that the risk of fatality was a function of species abundance, rather than whether they either sat on the road or swooped low towards vehicles. Controlling for species abundance, they noted that higher risk of collision was present in species with short flight range (therefore increased risk taking), solitary species, a large bursa of Fabricius, or with Plasmodium infection. This last observation brings us full circle, and raises the obvious question: does pre-collision infection increase the probability of collision by affecting risk-taking behaviour in humans? Common sense suggests it would. There may be more to infection and trauma than is currently acknowledged.